I hate to let things go to waste… so when we are shucking prawn shells for a meal, I like to save the shells to make a shrimp broth. I place the shells in a Ziploc freezer bag, and store them in the freezer until I have enough to make up a few batches of broth. 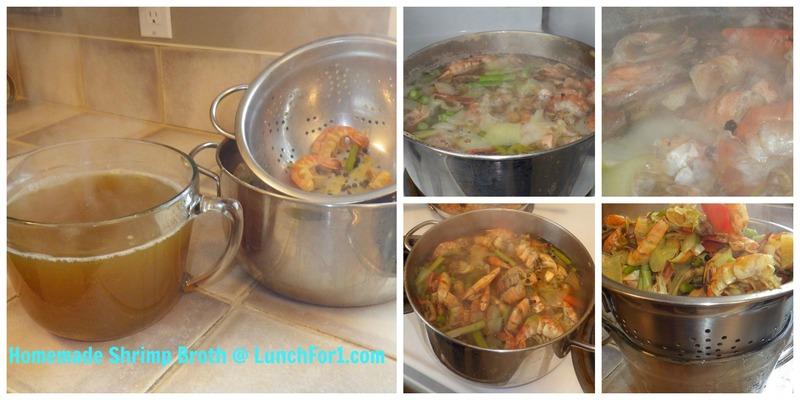 Easy DIY Shrimp Broth – what else are you going to do with those leftover prawn shells? This easy shrimp broth recipe was the base of flavour for my recent experiment in making my Shrimp-Flavoured Quinoa Pilaf which I will post tomorrow. In making any type of broth, you can pretty much do a fridge-cleaning on whatever vegetables you have hanging around. In this version I used asparagus ends, onion chunks and long celery spears. Then I flavoured the broth with 1 tsp. of sea salt, 1 tsp. of peppercorns, and chunks of fresh garlic. add veggies and spices of your choice. High to boil the mixture, then reduce heat to a simmer. Allow the flavours to meld for a couple of hours (or more). colander to strain off the prawn shells and veggies. Use this broth for Asian-inspired soups, seafood stews, mussels, or to flavour your favourite rice dishes. This broth also freezes well in handy-sized 1 cup Ziploc containers for future use. What types of homemade broth do you make?